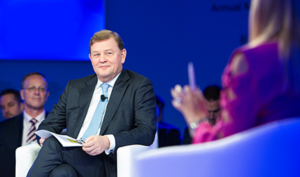 Speech by DSM’s CEO, Feike Sijbesma, at the One Planet Summit. Over a century ago, Royal DSM began as a state-owned coal mining company. Since then, we have transformed. First into a chemical company and later into a 10-billion-euro science-based company – thriving in health, nutrition, and materials – and employing 25,000 people worldwide, with sustainability as our core value. We reduce our own environmental footprint, we enable a low-carbon economy through the solutions we develop for our customers, and we advocate climate action – like here, today, in Paris. We see the transition to a low-carbon, circular, climate resilient economy as both a responsibility and a business opportunity. We don’t act in isolation. Through the We Mean Business Coalition alone, over 1,000 actions are being implemented by over 600 companies, with many of them – including DSM – moving toward 100% renewable electricity. We are one of the 1,200 companies that will align their emissions reductions plans with the Paris goals within a few years. I don’t need to repeat it: the world is not yet on track to deliver on the Paris Agreement. But we should, since it is our moral, societal, and economic obligation to take care of the planet we borrow from our children. To succeed the road ahead must be paved with more than good intentions: we must anchor real incentives into our economic system. The public sector cannot do this alone. We must mobilize the financials means, innovative power, and actions of the private sector. How can we do that? By putting a price on pollution and heat-trapping gases, so in other words a price on CO2, governments can help unlock trillions of private climate finance. To move this forward, 135 businesses, governments, and other partners have already joined the Carbon Pricing Leadership Coalition. I invite all of you to join us. First of all, broadening. The share of global emissions covered by a carbon price will rise substantially in the coming years. Gradually we are moving toward a level playing field. Dozens of national climate plans (Nationally Determined Contributions) already show an interest in carbon markets, and with China joining soon, it is clear: the train has left the station. But, to reach its destination, we must also discuss price levels. Secondly, deepening. I believe only meaningful price levels can provide long-term certainty to the private sector. Shifting to a low-carbon economy takes time and will require large investments, also in innovation. In this respect, the planned reforms of the EU emissions trading scheme, through a gradual reduction of allowances, is a great step forward. Recently the High-Level Commission on Carbon Prices, led by Nobel Laureate Joseph Stiglitz and Lord Nicholas Stern, concluded that the carbon price level consistent with achieving the Paris goals is $40-80/ton CO2 by 2020 and $50-100/ton by 2030. Their insights provide input for the discussions about minimum carbon price “floors”. Thirdly, linking. Collaboration between governments is key. The new initiative “Carbon Pricing in the Americas”, launched just now in Paris, is a lighthouse example. Some say “If you want to go fast, go alone. If you want to go far, go together.” When governments collaborate on carbon pricing, this incentivizes the private sector to go both further and faster. After all, if we gradually move towards a level playing field, companies will be able to compete on the basis of low-carbon performance and innovation. My fourth and final point: business is supportive, too. In the Declaration we launched just yesterday (11 december), over 50 companies call for carbon prices that provide direction towards a “well below 2-degree world”. Similarly, the World Economic Forum CEO Climate Leaders said in Davos, that to shift their investments accordingly, a price of up to – and even above – $40 is necessary within less than a decade. At DSM, we use a carbon price of €50/ton (about $58 at time of publication), essentially “future-proofing” our company. Over 1,400 companies disclosed to the CDP that they have done so, too, or are in the process of setting one soon. Many here today can have more impact than ever before. This also comes with greater responsibility to act, not only in the interest of future generations but also for our children who are already faced with climate disruption today. From the Horn of Africa to the Caribbean, to the South of Bangladesh. We cannot be successful, nor call ourselves successful, in a world that fails. So, let’s jointly look forward to a bright future and move! Hey Buddy!, I found this information for you: "Feike Sijbesma (CEO DSM): ‘The world is not yet on track to deliver on the Paris Agreement’". Here is the website link: https://www.duurzaam-ondernemen.nl/feike-sijbesma-ceo-dsm-the-world-is-not-yet-on-track-to-deliver-on-the-paris-agreement/. Thank you.